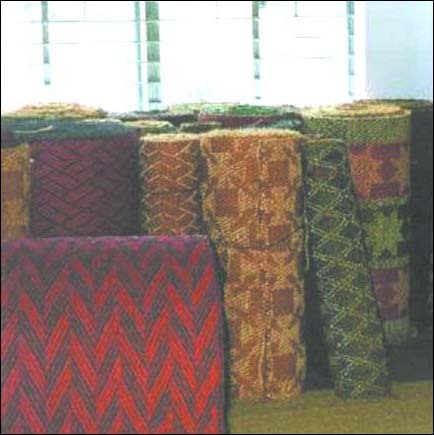 Coir industries in India and Sri Lanka have a strong export orientation with the sale of traditionallymade yarn, mats, matting, rugs and carpets. (Figure 11). Since the mid-1970s, export markets have begun to decline because of severe competition from synthetic fibres. A gradual recovery during the last decade can be ascribed partly to increasing ecological awareness on the part of consumers in the industrial countries. Besides superior performance for durable matting, a strong marketing argument for coir is its eco-friendly and natural image. Exporters of dyed coir products, however, are confronted with banned dyestuffs and legislation in Europe (and especially in Germany) for ecologically safe products. Buyers of coir products insist that banned dyes not be used. The more advanced private companies have the vision and funds to be able to invest in improved dyeing technology and wastewater treatment systems. The many thousands of smallscale producers are less fortunate. Domestic industry in India was firm that all banned dyes have been removed from production lines, and are no longer in use. Companies have switched to alternative recipes, including those developed by the CFC/FAO project. In order to explore and exploit the larger export markets for diversified coir products, environmentally safe technologies need to be developed and implemented by local producing industries. It follows that special attention has to be given to the chemical processes of bleaching and dyeing involved with manufacturing, for the improvements in ecological performance of the products that are 29 possible. More efficient methods for processing and chemical recovery and wastewater treatment are of interest to the scientist and technician, but also essential for industrial application. On laboratory scale, the dyeing of coir has been given due attention by the project team at the CCRI, exemplifying the range of improvements possible at industrial production level. This technology now needs to be applied to factory conditions. Eco-labelling is one of the important issues for export market promotion, and will require the development of a recognized certifying institute. The additional costs of the dyestuffs and the reduced brilliance of the dyed fibres hamper the introduction of preferential direct or reactive dyes, when compared to basic dyes. The fastness of direct dyes is better but, for many applications, the durability of the products is not a marketing issue. Data to qualify the current contribution of these alternative dyes within the market were not available. Since many of the coir exporting companies are relatively small- or medium-scale enterprises, access to up-to-date marketing information is strictly limited. This restricts their ability to keep abreast of changing market needs. Marketing is also hampered by the inability of the producer to meet the material needs of the larger markets. Most producers provide a wide range of different products, and sell these in relatively small numbers. This contrasts with requirements of the larger conglomerate supermarkets in Europe and elsewhere demanding relatively large quantities of a single item, with firm demands on quality and delivery to schedule for this item. An exclusive product such as this may be marketed only once. However, if successful, further sales of a different (but similar) product are possible during the following year. Thus there is continuity in markets for the coir fibre producer, but for different products. For the co-operatives it is difficult to penetrate export markets, since marketing of coir products is centrally organized. Profits are marginal and insufficient to provide capital for investment in, for example, new equipment or technologies. Minimum export prices for coir products are established to guarantee the income of workers (with the interests of the producer/entrepreneur a second priority). Private enterprises, which may be more inclined to invest in mechanisation and improved technologies, are also confined to the same fixed prices. Thus there is little incentive for industrial change. The introduction of power-looms would raise productivity and result in lower labour costs. However, labour unions attempt to retain traditional methods of weaving and matting with the use of wooden hand looms, to secure levels of income and this leads to an entrenchment of traditional practices. Industrial productivity cannot easily be improved in these circumstances. Access to a reliable and guaranteed supply of raw materials and products of high quality standard is a considerable threat to coir export markets. Further, the quality of fibre supplied can be mixed. Meeting standards and delivery schedules required of buyers is important to ensure customer satisfaction. Natural materials such as coir fibres, however, are rarely uniform and security of supply can be variable as unseasonable weather or the demands of competing markets may, for example, bring a measure of risk. Traders are normally required to work hard to met the demands of the client. For increasing exports, the publicity required for coir and coir products is an important marketing tool. Providing information and raising awareness on the part of the client, of the advantages of coir, for example, and its ecological performance, is challenging. This requires considerable effort and investment. However, marketing information to describe new and/or existing products is essential, and should address the ecological aspects involved in relation to, for example, renewable resources and humane production systems. But ecological arguments notwithstanding, buyers will not be interested if prices are unattractive. Guaranteed supplies of high quality products should be emphasised. Demands by the customer for design and shades of colour should be met, as required. Existing marketing and distribution systems, should be used to the full, with the cooperation of local commercial partners.